So now you know as an offense that you want to attack specific open gaps what do you do when the defense is being unpredictable with the gaps they leave open? This is where complementary run plays come in. A complimentary run play is a run that usually looks similar to another run but more importantly attacks another part of the defense in case your initial run play's gap is closed. but have an audible that attacks another gap like the B gap in inside zone. 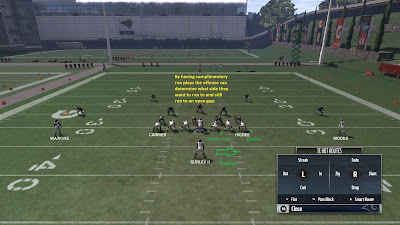 If you notice on the above plays everything from the linemen's and wide receiver's blocks to the initial steps of the running back all looks the same. This is important because for a split second at the beginning of the play the defense shouldn't be able to tell by the player's movement what area the play is attacking. This split second of hesitation can hold the pursuit of the defense and help the play be more successful. So now you have two plays that look similar at the snap but attack different areas. You have also have a chance of getting into a good play against whatever front you see. This can be done by calling a run play that's an outside run and having your audible as an inside run. Also, keep in mind these plays can also be flipped to add more opportunities for the offense. Complimentary plays allow you to have more options when you come to the line of scrimmage and not hope the defense left the gap open for the specific play you ran. For more on this topic check out this article. Thank you for reading play comment and share. If you have any questions please let me know.